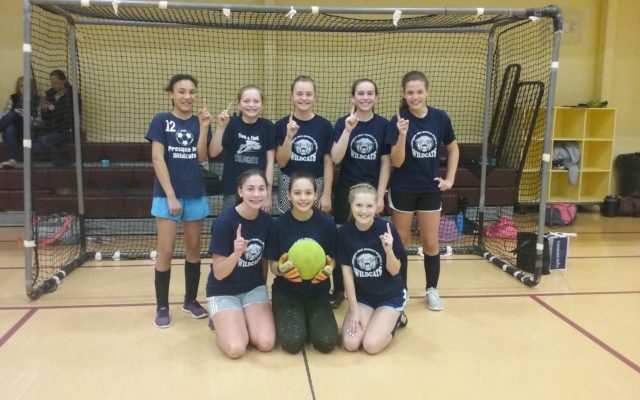 The Caribou Recreation Department hosted the 7th annual Middle School Aged indoor soccer tournament Saturday, March 30, with teams from around Aroostook County participating. CARIBOU, Maine — The Caribou Recreation Department hosted the 7th annual Middle School Aged indoor soccer tournament Saturday, March 30, with teams from around Aroostook County participating. Girls tournament teams played in the morning and consisted of two Presque Isle teams, Caribou, Madawaska, Fort Kent and Houlton. This tournament was set up with a round robin format to seed teams in a double elimination format, according to Matt Bouchard, Caribou’s recreation director. Games were played throughout the day and were of great intensity with a few games going into overtime or penalty kicks to determine the winner. The Houlton girls fell into the loser’s bracket after the first playoff game and had to play some back to back games to make it to the championship game against Presque Isle blue. Presque Isle emerged victorious. The boys played in the afternoon and saw five teams — Caribou, Houlton, Woodland, Fort Fairfield and Madawaska — competing for the crown. The format was set up the same way and once again Houlton fell into the losers bracket early, but found a way to bounce back into the championship.The Shires fell to Madawaska, who finished unbeaten in the tourney.